Alan Brinkley is a professor of American History at Columbia University. His previous books include Voices of Protest: Huey Long, Father Coughlin, and the Great Depression, which won the American Book Award for History, and The Unfinished Nation: A Concise History of the American People. His essays, articles, and reviews have appeared in the American Historical Review, the Journal of American History, The New York Times Book Review, The New York Review of Books, the Times Literary Supplement, The New Republic, and other publications. He lives with his wife and daughter in New York City. When Franklin D. Roosevelt and his Democratic party won a landslide victory in the 1936 elections, the way seemed open for the New Deal to complete the restructuring of American government it had begun in 1933. 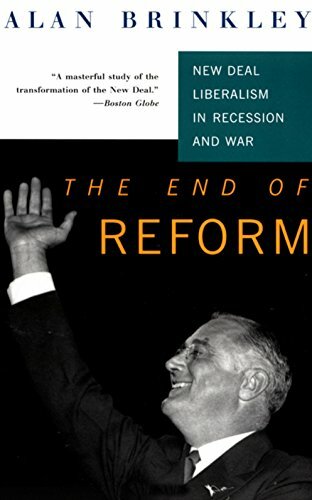 But, as Alan Brinkley makes clear, no sooner were the votes counted than the New Deal began to encounter a series of crippling political and economic problems that stalled its agenda and forced an agonizing reappraisal of the liberal ideas that had shaped it -- a reappraisal still in progress when the United States entered World War II.